Bringing well-rounded shooting capabilities to the medium format realm, the Hasselblad H6D-100c revolves around an impressive 100MP 53.4 x 40mm CMOS sensor to produce high-resolution stills as well as UHD 4K video. Making use of the CMOS design, this sensor affords a wide sensitivity range of ISO 64-12800, along with 16-bit color depth and a dynamic range of up to 15 stops to maintain notable detail and quality when working in the most difficult of lighting conditions. 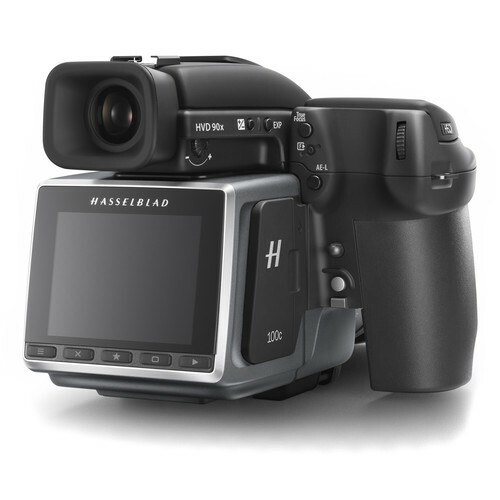 Coupled with an enhanced electronic platform with faster processing capabilities, continuous shooting speeds up to 1.5 fps are possible, as well as the ability to shoot both UHD 4K and Full HD video at 30 fps in the Hasselblad RAW format. Now suitable for multimedia image-makers, the H6D maintains its exceptional stills recording capabilities and adds versatile video recording abilities to its skill-set. Beyond imaging, the H6D also sports improved connectivity with the inclusion of a USB 3.0 Type-C connector for fast 5 Gbps transfer speeds and more fluid tethered shooting performance. The back itself incorporates a bright, clear 3.0" 920k-dot touchscreen LCD monitor for live view shooting and intuitive settings control, and a Mini HDMI port is available for working with larger external monitors. In-camera saving is possible via dual memory cards slots—one CFast slot and one SD slot—and files can also be saved remotely when shooting tethered over USB 3.0. Built-in Wi-Fi can also be used in conjunction with iOS devices running the Phocus Mobile app, which permits wireless remote control of the camera as well as the ability to preview imagery and browse files. Revolving around a large 100MP CMOS sensor, measuring 53.4 x 40.0mm, the H6D-100c is capable of capturing an extremely wide dynamic range of up to 15 stops along with vivid 16-bit color depth. When combined with the Hasselblad Natural Color Solution, tonal transitions and skin tones show immense depth, detail, and clarity for lifelike image quality, even in dark shadow and bright highlight regions. To suit working in a variety of lighting conditions, a sensitivity range of ISO 64-12800 is available, and still files are saved in the Hasselblad 3FR raw file format. An improved electronic processing platform offers quicker performance throughout the camera system, along with more flexible connectivity options. A continuous shooting rate of up to 1.5 fps is available, along with an expanded buffer compared to previous H-series cameras for longer sustained shooting. This platform also expedites the handling of the large image sizes and permits recording both UHD and Full HD video. In addition to high-resolution stills shooting, the H6D can also record both UHD 4K and Full HD 1080p video at 30 fps. Video can be saved in the proprietary Hasselblad RAW format, which can be converted to the edit-friendly Apple ProRes format using Phocus 3.0 software. Full HD video can also be saved in the H.264 compressed format for greater editing flexibility with a variety of software options. In addition to tethered shooting, dual memory card slots are incorporated into the back for flexible storage capabilities. One CFast card can be used for fast read/write speeds, which are necessary for continuous shooting or UHD 4K video recording, and one SD slot is provided for backup storage and wide compatibility with existing cards and card readers. Box Dimensions (LxWxH) 12.0 x 11.6 x 7.5"
H6D-100c Medium Format DSLR Camera is rated 4.2 out of 5 by 5. Rated 3 out of 5 by Peter L. from Not Quite Ready for Primetime In the interest of full disclosure, my H6D arrived DOA with a firmware error. We rolled the firmware back one version and the camera worked for 20 shots then had another system error. I was deeply disappointed because the sensor is incredible. However, I don't believe this newly redesigned electronic platform is ready for the rigors of the real world quite yet. Hasselblad will work out the glitches, but as a pro you can't risk going into a high-end shoot and having your main camera turn into a brick. Sticking with my H5D for a while. Rated 4 out of 5 by Peter L. from A Beast I'm coming from an H5D-50c and the big draw for me was the 1.0 crop factor, and the newly designed electronics that have USB 3.0. It feels exactly like the previous H bodies, but the back is totally new. The interface is smooth and silky like an iPhone. The images themselves - breathtaking clarity. There's something about a photo taken on a sensor this large that can't be duplicated by other systems. So far the results out of the camera into Phocus have been tremendous - definitely better than the H5D-50c. I would honestly rate it 5 stars, but I had major issues out of the box with the firmware. The system kept crashing, and I spoke with Hasselblad. The H6D is shipping with a version of the firmware that isn't yet public on their website (1.12.2), and it just wouldn't work right. I downgraded to the published version of 1.12.1 and it's been smooth sailing since. But they get dinged for sending me a camera that costs more than a BMW that had wiggy firmware. Rated 4 out of 5 by Michel C. from Fantastic resolution. Firmware not there yet. I took the camera to Iceland some picture are out of this world. The good: The pictures are great. The dynamic range amazing. Ergonomics for 100MP Camera, Great. 4K on Medium format. Did not use it, but nice to have. The not so good: The firmware is still not there. The Gil (GPS adaptor) does not work yet. The H6D should have a GPS included inside without the need for an Adaptor. The Auto phocus could be better but it is not bad. The Bad: Sensor issues: The dual readouts from the Chip not reading equally at high ISO on some cameras. You might get a split image like different WB. Hasselblad will re-calibrate the camera in Sweden. For this and other issues read the Hasselblad Forum: www.hasselbladdigitalforum.com. If you are patient with the system. You have a backup camera. You can own one without fear. The photos are great. Do not think because you spend a fortune you will get a camera that has the autofocus, speed and all the additional features the Nikon D850 or a Canon 35mm have. The Medium format have issues. If you need medium format that is 50MP beside the H6D look at: The Pentax 645Z Fujifilm GFX 50S Hasselblad X1D-50c To be more specific, do take a very close look at the Fujifilm GFX 50S. If you want 100MP the choice is: Phase One XF 100MP or Hasselblad H6D-100c Both are great cameras with their challanges. I like the Ergonomis of the H6D. What kind of audio does it record in video? Hasselblad states that the audio files are saved as an audio.mp4 file. The file is a 720p version of the RAW video and the sound encoded in AAC. This is done to keep the video and audio in sync. Please send your inquiry via e-mail to stagelighting@bhphotovideo.com. Thank you. At one time I think I remember you could get a GPS attachment for the H series cameras. Does the H6D-100C GPS if not is an accessory available? Unfortunately while Hasselblad makes one GPS unit, the GIL, it is not compatible with the H6D-100c. You can not use the Nikon version of the Air Remote. The non-TTL version will work with the H6D camera system. Do any of the remote shutter releases work with the H6D-100c? There is a release cable for the H6D-100c, it also works with the 50c. The part# is H-3043370 (list price $87.00). When you go to the Hasselblad web page it says the 24 abd 28mm lens are compatable up through the H5 series. So they are not compatable with the H6D-100c camera?